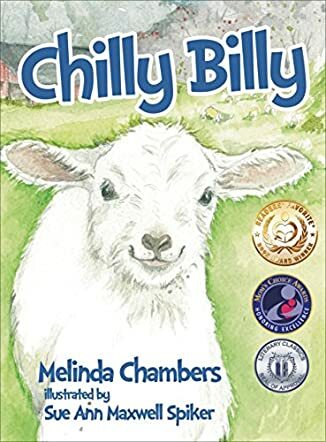 Chilly Billy by Melinda Chambers is a children's picture book that tells the story of a young lamb born on a very cold night. He loves his life on the farm, exploring the yard each day, until one day his friends want to explore outside of the fenced yard. Chilly Billy stays back, causing the flock to call him Silly Billy, but he remains steadfast in his beliefs. The lambs who escaped the fence then become lost and in danger and have to be rescued by the farmer. Then they realize that maybe Billy wasn't so silly after all. Chilly Billy realizes that it's good to have friends, but sometimes you have to stand up for what you believe in and do your own thing without "being a sheep." Melinda Chambers has done a great job in Chilly Billy, telling children (and adults too for that matter) that sometimes it's best not to follow others like a sheep, but to make decisions for yourself. This moral, hidden cleverly in the story of Chilly Billy, is such an important lesson for kids to learn. Beautifully illustrated, Chilly Billy is a feast for the eyes as well as a wonderful story to read to your children. Melinda Chambers is superb at teaching a lesson in Chilly Billy without pounding it into your head. Kids will enjoy reading Chilly Billy alone or having it read to them by their parents, opening up a good opportunity to talk about not being a sheep.